In 12-inch nonstick skillet, cook beef over medium-high heat 7 to 9 minutes, stirring frequently, until beef is browned. Add onion and bell pepper; cook 4 to 6 minutes or until softened. Add garlic and flour; cook 2 minutes, stirring frequently. Add tomatoes, taco seasoning mix and pepper. Cook and stir 1 minute. Stir in broth and whipping cream; heat to boiling over medium-high heat. Cook and stir until thickened. Reduce heat; simmer 5 minutes, stirring occasionally. Remove from heat; stir in cheese. When cheese has melted, stir in sour cream; transfer to baking dish. Meanwhile, in large bowl, stir Bisquick™ mix and milk just until moistened. Drop dough by 12 large spoonfuls on top of hot filling. 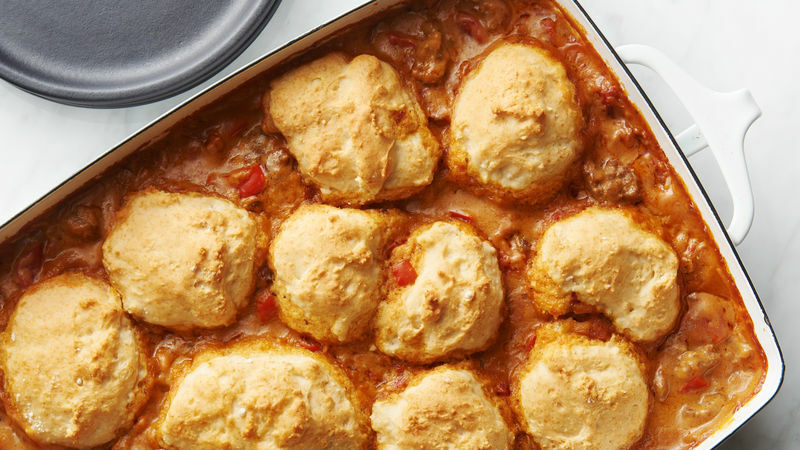 Bake 18 to 23 minutes or until casserole is bubbly and biscuits are golden brown. Let stand 10 minutes before serving. For a touch of heat, add a finely chopped jalapeño chile along with the onion and bell pepper. Pepper Jack cheese can be substituted for the Cheddar cheese in this recipe.